The auto industry may be skeptical, but Better Place's battery-swapping strategy has attracted government support and $350 million from investors. There's a strange disconnect surrounding Better Place, the company best known for its plan to extend the range of electric vehicles by relying on speedy battery swaps. Automotive executives are nearly unanimous in dismissing the idea. With the conspicuous exception of Renault-Nissan CEO Carlos Ghosn, rarely does an executive express interest. Yet Better Place is getting increasingly credible support from governments, banks and major corporations. So far this year, it has signed an extensive deal with General Electric and picked up $350 million in financing. 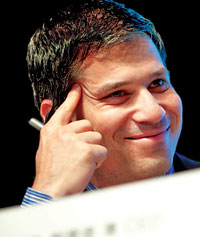 In an interview at the Paris auto show, Shai Agassi, the Palo Alto, California, company's founder and CEO, attributed his cool reception in automotive circles to "a lack of belief that something that big can happen in the industry." Chinese automakers are more receptive than traditional industry powers, he added. "Incumbents in an industry that is slow to change tend to believe that the speed of change will remain constant," Agassi said. Better Place founder Shai Agassi thinks the auto industry lacks faith "that something big can happen in the industry." Better Place has attracted mainstream backing this year. • General Electric will work with Better Place in technology development, battery financing, fleet programs and consumer awareness. • Better Place raised about $350 million from investors led by HSBC, which itself put in $125 million. -- Last month's alliance with General Electric calls for cooperation in four areas: technology development, battery financing, fleet programs and consumer awareness. Agassi said making GE chargers compatible with Better Place equipment will expand the reach of both companies. -- In January, Better Place raised about $350 million from investors led by HSBC. The London-based financial services giant put in $125 million of its own money and took a 10 percent stake and a board seat. "What you're starting to see is a trend," Agassi said. "It's not just the crazies anymore. It's the leaders." The new funding is being poured into Better Place projects in Israel and Denmark. Both government-backed efforts will set up nationwide networks for rapid recharging and battery switching. Ghosn's support has been crucial for each. The electric version of the Renault Fluence sedan will be the first vehicle using the network. Interestingly, though, Renault partner Nissan chose to use an enclosed thermal management system for the battery pack in the Leaf EV, meaning the car's battery cannot be swapped. 1. Does the system work? 2. Do consumers like it? 3. Can it be duplicated? "If the answer is yes to all three, then we replicate it around the world," Agassi said. 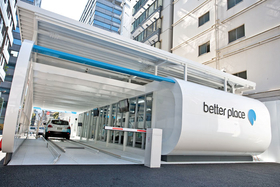 Better Place has another project beginning in Australia and, at the behest of the Japanese government, is testing battery swaps with Tokyo taxis. So far, the company says, the average swap time is 59 seconds. The tough nut to crack is the United States, Agassi admitted. The core issue there is the relatively low cost of gasoline. Better Place's basic model is to replace the fuel station, he said. Investors look at $3-a-gallon gasoline in the United States and figure their return on investment will be better in Europe, for example, where fuel costs twice that. Nevertheless, Agassi said he expects Better Place to penetrate the United States eventually. He added that he has no interest in the path taken by EV makers that focus on small, limited-range "city cars." "An American buyer doesn't want to drive a small city car," Agassi said. "You've designed a car for a guy who doesn't have the ability to buy the car. Most of these guys in Birkenstocks, they don't have the $35,000 to buy a third car for the family." Instead, he wants to persuade an automaker to make an electric, battery-switchable SUV for American buyers. With such a vehicle, Agassi said, there would be "no gasoline, no stigma." "You've got the Diet Coke of cars," said Agassi, clearly eager. "You've got all the taste and none of the guilt."